Continuous dredging of the channel began in March 1859 using ladder dredges to remove mud, sand, boulders and surface rock to ensure the safe passage of ships. These days, safely and reliably managing thousands of ships a year depends heavily on the work of the 70 m David Allan dredger, which operates 12 hr/d, seven days a week. The David Allan is tasked with maintaining a channel depth of 15.2 m along a 9 km stretch from the breakwalls to the Kooragang 10 berth in the river's South Arm. Port of Newcastle dredge manager Calvin Grills said it was important to acknowledge and celebrate the role of this maintenance dredging in the success of Port of Newcastle as a global trade gateway. "Tens of thousands of ships, collectively transporting several billion tonnes of cargo, have navigated the channel over the past 160 years," Grills said. 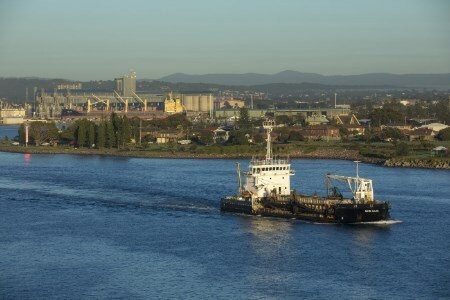 "This international trade in steel, coal, fuels, grains and other important cargoes has only been possible because the channel has been kept clear, enabling New South Wales businesses to be globally-competitive." Maintenance dredging is a process of removing sand, silt, mud and other material through a suction trailing arm into a hopper in the hull of the ship. This is then carried out to a designated area about 1 km out to sea where the hull is opened and the material is deposited. This process is an essential part of maintaining keel clearance of vessels with deep drafts to ensure safe and seamless passage through the channel for trade to efficiently make its way to its final destination. Silt build-up is a natural part of the Hunter River's normal function. Much of the silt dredged from the Newcastle harbour comes from the North Arm of the river, which is broader and shallower than the South Arm. The particles are carried along more quickly, before much of it is dumped in the slow sweep of the river off Stockton known as the Horseshoe.